New Ramah Primitive Baptist Church, Ray City, Berrien County, GA was founded in 1913. The church building was dismantled in 2010. New Ramah Church was located on the southwest side of Ray City, between Park Street and Cat Creek. The primitive baptist church was organized August 30, 1913, and built by four Knight brothers who were the descendants of William A. Knight. Aaron Anderson Knight was called as the first pastor and served until his death in 1925. State of Georgia, Berrien, Co.
By the Goodness of God, now when names are after written, having been Baptized upon a Profession of faith by the Lord Jesus Christ having here to fore been members of different Churches did consent on the propriety of becoming a Constituted body near Rays Mill, Ga. Believing it to be expedient, finding a fellowship with each other, jointly chosen to set apart this day for Constitution. Petitioning Salem, Empire, Unity & Pleasant Churches for Ministerial aid as a presbatry (Presbytery) which has granted Eld. I. A. Wetherington from Unity Church, Eld. H. W. Parrish from Salem Church, Eld. A. A. Knight from Pleasant Church, Eld. E. R. Blanton from Pleasant Hill Church and Eld. E. Lindsey from Ty Ty Church were clothed with church authority and gave theyr attenuance and letter of dismission being presented and no deficiency appearing, being sound in the facts and principals of the Gospel, that is to say believing that the scriptures of the Old and the New Testament are the Word of God and contains everything necessary for the faith and practice, Particular the existence of one true God, the fall of Man and his inability to recover himself, God’s savoring [sovereign] choices, of his people in Christ, theyr Covenant head from before the foundation of the world effectual calling purification by the imputed righteousness of Christ alone, The final perseverance of the saints in grace, and eternal salvation in Glory, the duty of baptism by immersion, and the Lords Supper. Thus pronouncing to be upon above principals. having united upon equal terms and here after be called and known by the name of New Ramah Church, and for this end deliberately solemly give our selves to the Lord, and to each other by the will of God, Independent of any religious body or congregation what ever, covenanting and promising each other to live to gether as becomes brethering in Gospel hands for the maintaining of Christian fellowship and gospel discipline agreeable to the holy scripture and as true yoke fellows agreed to stand or fall together in order, for which we do agree to receive, and adopt the following plan of or form of Decorum and Rule of practice. 2nd Church meetings shall begin and end with Divine worship. 3rd Church members failing to attend two Conferences in succession it shall be theyr duty to make known to the Church the reason of theyr absence at the next conference, and the Church judge of the same, but if the failure happen without the Church having knowledge of there being laudable reasons, she shall have him cited and Judge of such failure. 6th The moderator shall in his Power preserve order, Shall explain and put questions. He shall have an assistant (when present) if needed but in his absence a moderator protem shall be appointed. 7th The Moderator shall have the same right of speech as another member but shall not vote unless the body be equally divided. 8th The Church shall have a Clerk who shall keep a fair record of theyr proceedings and sign theyr order before the Conference rises. Minutes taken by the Clerk shall be read and amended before the conference rises if necessary. 9th In debate, only one person shall speak at the same time, who shall rise from his seat and address the Moderator in an orderly manner. 10th The person speaking shall strictly attend to the subject in debate, shall not reflect on the person that spoke before him by making remarks on his slips, or imperfections, but convey his own ideas. 11th The person speaking shall not be interrupted unless he breaks through these rules. Then the moderator shall call to order if dissatisfied he shall —- the voice of the conference. 12th No person shall speak more than twice to the same proposition till every one choosing to speak has spoken. The Church minutes of New Ramah Primitive Baptist Church provide the list of male and female members below. Notations next to the names were updated by the Clerk with the status by which the member joined and departed the congregation. Many notations were too faint to be legible for transcription. 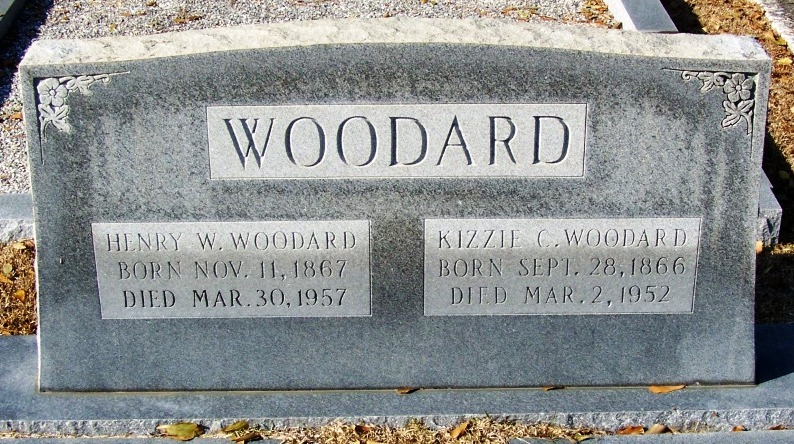 Henry Woodard and Kiziah “Kizzie” Corbitt Woodard lived in Ray City, GA in the 1930’s. Henry Woodard operated a blacksmith shop located on the Ray City Nashville Highway between Main Street and Jones Street. 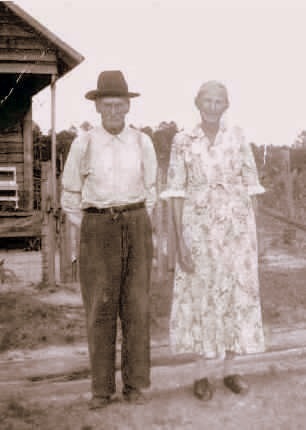 Henry and Kizzie Woodard photographed in Pearson County, GA.
Henry Woodard, born Nov. 11, 1867, was the eldest son of Wiley H. Woodard and Delilah Ann Brantley. He was born in Militia District 1144 (the Rays Mill District), Berrien, Georgia and grew up in the Ray’s Mill vicinity. In the Census of 1880 Henry Woodard is enumerated with his parents, living in the household of his grandfather, Wiley Woodard, in the 1300 Georgia Militia District (now in Lanier County). 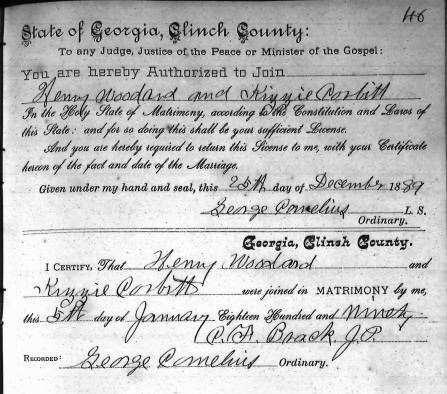 Henry Woodard married Kiziah Corbitt on January 5th, 1890 in Clinch County, GA. She was born September 28, 1866, a daughter of Rowena Guthrie and Martin Lafayette Corbitt. It may be that Henry Woodard purchased the Ray City blacksmith shop from Emma Warr, widow of the town’s previous blacksmith. Her husband, Rollie Warr had died some time in the 1920s. Henry Woodard owned a home in Ray City valued at $600. His next door neighbors were Edwin D. Griner, who worked as a miller at a Gristmill, and his wife Sarah, who was a trucker on a truck farm. Woodard lived and raised his family in Clinch, Coffee, and then Atkinson county before moving back to the area of his birth in Berrien county. He was occupied most of his life as a farmer but by the time he moved back to Ray City in the 1920s, he had taken up working as a blacksmith. PEARL WOODARD, b. March 20, 1891 Clinch Co. GA; d. March 05, 1941,Coffee County GA.
HENRY LAFAYETTE WOODARD, b. March 1894; m. Loucreasy O’steen; d. Feb. 9, 1959, Ray City, GA.
LOU ANNIE “Lizzie” WOODARD, b. May 2, 1895, Georgia; m. John Riley Osteen; d. March 7, 1983. DENNIS WOODARD, b. December 1899, Georgia; d. Abt. 1970. Kiziah Corbitt and Henry Washington Woodard are buried at New Ramah Cemetery, Ray City, Georgia. Grave of Henry Washington Woodard and Kiziah Corbitt, New Ramah Cemetery, Ray City, GA.